In ‘La Reproduction Interdite’, a figure is shown standing in reflection before a photographic artwork. 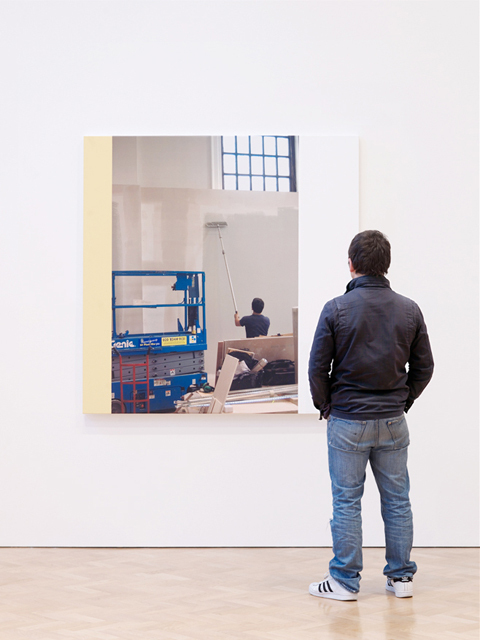 The artwork is ‘The Wall’ by the Canadian artist Ian Wallace, an image that depicts a gallery space in a state of reconstruction prior to an exhibition. In a concise demonstration of Wallace’s pioneering photo-conceptual art practice, the very same walls, now immaculately prepared, became the hanging location for ‘The Wall’ during its presentation at Hauser and Wirth Gallery London in 2008. The figure within ‘La Reproduction Interdite’ [Reproduction Prohibited] is the British artist Jonathan Allen, who stands mirroring the position of a wall-painter busy at work within Wallace’s photographic panel. Allen’s eponymous and visual reference to René Magritte’s painting La Reproduction Interdite  points to a more involved scenario. In the past, Allen has supported his artistic practice with occasional construction work, sometimes undertaken within art world institutions. Unbeknownst to either artist, Wallace photographed Allen as he undertook one such engagement: the painting of the walls within the gallery where Wallace would return to exhibit in the forthcoming months. 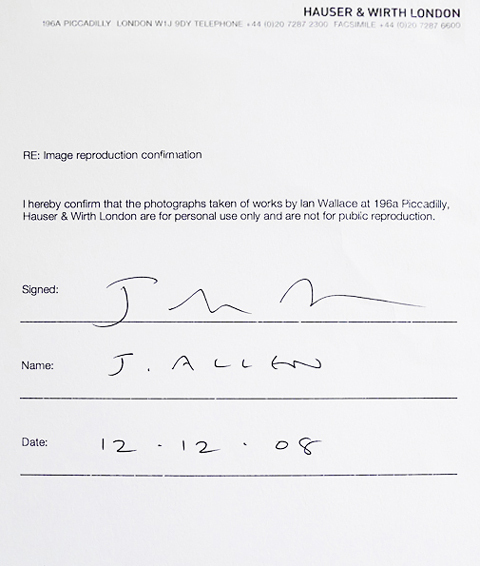 Despite his inclusion, Allen was required to sign a disclaimer by Hauser and Wirth when he made a request to photograph 'The Wall', thus prohibiting him from reproducing his own photographic image. ‘La Reproduction Interdite’ activates this spatial, litigious and pictorial field in the form of an affectionate photographic riposte which restages an encounter between two individuals drawn together contingently, but also separated by the institutional structures through which they fleetingly pass.